In recent years, the Italian shipping company Grimaldi has been investing massive amounts in new, eco-friendly ships. 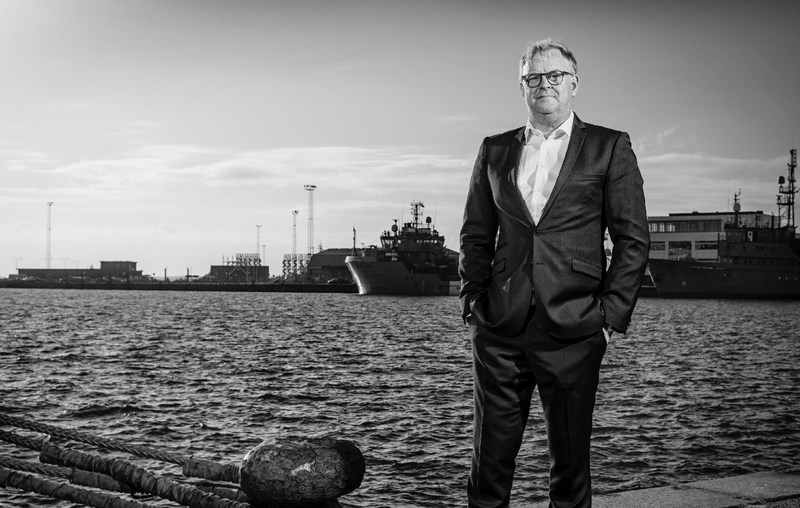 In Esbjerg, the shipping company's green ambitions are already hitting the mark, according to the shipping company's regular business partner at the port, the Niels Winther Group. "We are happy and proud to be partners with a shipping company that is determined to remain at the cutting edge," they say. In October, Grimaldi announced plans to invest up to EUR 1 billion in a new generation of ships comprising ten multi-purpose and RoPax ships (RoPax means the ships will offer a roll on/roll off service as well as room for passengers, Ed.). The announcement comes in the wake of Grimaldi's most recent launch of 12 new hybrid ships developed in collaboration with the Danish ship design company Knud E. Hansen, with its head office in Helsingør. The hybrid ships are expected to be ready in 2020. "It is spreading like rings in water right now," says Henrik Otto Jensen, CEO of the Niels Winther Group, as he describes the climate and environment agenda in the shipping industry in general and Grimaldi specifically. Henrik Otto Jensen and the Niels Winther Group have been Grimaldi's regular business partners in Denmark for the past 20 years. "The shipping industry is facing major environmental and climate challenges, and it goes without saying that it is positive that one of the world's largest RoRo shipping companies is actively stepping in to reduce emissions," he says from the head office in Esbjerg. Grimaldi's ambition is for the new generation to reduce fuel consumption by 30-40%. 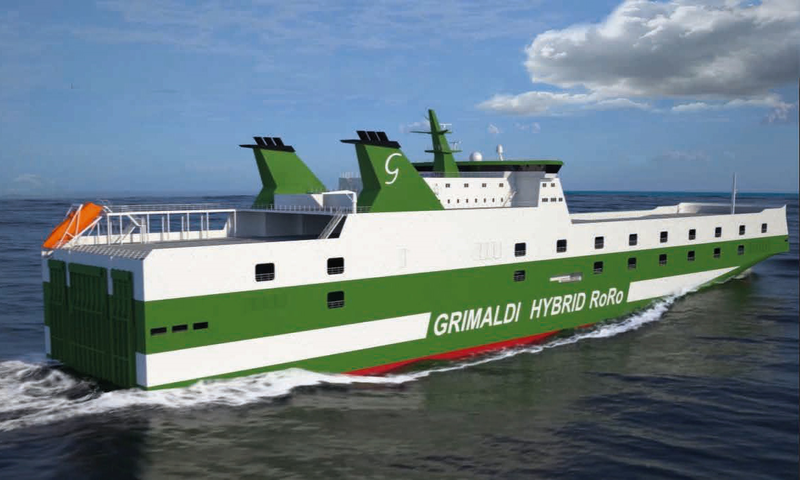 Grimaldi's new billion-euro investment is expected to be settled next year, and is the most recent phase of the project to renew its fleet in recent years. In addition to the new ships being built, the renewal also includes renovating the existing ships. Over the past three years, the shipping company has focused on updating its existing fleet, which consists of 116 ships altogether. This means that some of the ships that call at Esbjerg have been overhauled. This includes silicone paint, etc., which reduces resistance and contributes to fuel reduction, and systems that clean and disinfect ballast water. However, now the pace is picking up with a new generation of ships that use hybrid technology and lithium batteries. "I think it's a combination of technologies that will make a big difference in the years ahead, for example batteries, scrubbers and paint. That is evident in the new ships that are arriving," says Henrik Otto Jensen. Henrik Otto Jensen highlights that it is the combination of technologies that will make a big difference in the years ahead. Global shipping stands for about 2.2% of total CO2 emissions worldwide, and the environment and climate are high on the agenda of both the EU and UN's International Maritime Organisation, IMO, which passed a historic Climate Agreement in the spring of 2018. It obligates the industry to halve its CO2 emissions by 2050 as a step towards a complete phase-out. The agreement also includes a handshake to strengthen design requirements for all individual types of ships. Grimaldi's announcement about the new investment in October coincides with the start of negotiations on the implementation of the Climate Agreement at IMO's offices in London. According to Henrik Otto Jensen, the industry can gain excellent inspiration from the technologies Grimaldi is using in its new ships. In fact, the new technologies mean that Grimaldi is very close to fulfilling IMO's objectives for reducing emissions by 2050. Though he says that does not necessarily mean that IMO is lacking behind. "We must understand that this must be driven by both politics and the market. The investments that the shipping companies will make are gigantic and some will be unable to keep up if we move too fast," he says. It is bound to happen anyway as the shipping companies update their fleets and buy new ships. Then the green technologies will be the default, according to Henrik Otto Jensen. He is noticing that both customers and suppliers are clearly aware of the green opportunities, and he is sure that sustainability will be a vital parameter for future purchases in the transport industry. "Who knows, perhaps Esbjerg will have a whole new type of service company in 20 years' time specialising in these technologies and servicing the new ships." Grimaldi's link with the Port of Esbjerg dates back many years and began with the EurMed ferry route established at the end of the 1990s. The route is the only direct link by water between the Mediterranean and Denmark, and it is celebrating its 20th anniversary. An anniversary that also makes it the second-oldest shipping route in Esbjerg, beaten only by the DFDS ferry to England. During all those years, the shipping company's business partner at the port has been Niels Winther & Co. with Henrik Otto Jensen at the helm. He has also launched Scandinavian Auto Logistics A/S with Grimaldi as its main shareholder. The company now stands for 30% of car imports to Denmark, corresponding to about 75,000 cars a year. When Henrik Otto Jensen reflects on how the collaboration began and the 20 years that have passed, it is evident that the green ambitions have accelerated in earnest in recent years. "Ten years ago, it was not easy to see but today it is high on the agenda and something we discuss a great deal, and we can also see the concrete results of the green ambitions already," he explains. Today, for example, the ships berthed in Esbjerg can move twice as many goods with the same emissions compared with ten years ago. And last year, Grimaldi reduced its total CO2 emissions by 3.3% and sulphur emissions by 6.2%. It is unknown when the new billion-euro investment will result in ships being launched. But Grimaldi's latest project, "Green 5th Generation", is well under way and expected to be ready in 2020. The series comprises 12 new hybrid ships that can each transport about 500 containers. Three of the new ships will join Grimaldi's fleet in the Mediterranean. These are the ships that call at Esbjerg once a week carrying cargoes of food and cars etc. - Comprises 12 new hybrid ships that are 238 metres long and have a gross tonnage of 64,000 tonnes. - The ships use fuel while sailing but electricity when docked. They therefore emit no CO2 while in the port. - While sailing, the ships obtain electricity from large lithium batteries that are recharged by generators running on solar energy. - The ships have a special "air lubrication system" consisting of a special type of lubrication under their keels that via small surface bubbles, reduces friction and resistance and therefore fuel consumption. The ships are also covered by a special silicone paint that also reduces friction. - The ship has a technology onboard that exploits the chemical reaction between the sulphur and salt in seawater to produce gypsum, which can be recycled or disposed of onshore.